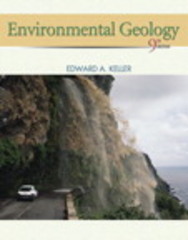 Environmental Geology 9 Edition Having originally defined the Environmental Geology course, this is considered the most comprehensive yet readable book for your course level. Keller continues to offer the most detailed, current research available. He covers a wide range of topics, discussing everything from fundamental geologic principles to the specifics of environmental law and geologic hazards, from a truly environmental perspective. The Ninth Edition emphasizes the engineering geology approach, especially in the discussion of soil and rock mechanics and landslides.